Art is what touches the heart and enriches the soul. Art's Work Unlimited is a full service custom metal shop which includes fabrication, restoration, welding, components and structural pieces. Both Phil and Art are hands on and oversee every project from design creation, to installation. They give affordable options in their proposals from the simple to the very complex. They have strong relationships with Architects, Designers and Builders in the industry and take pride in every piece of work that goes out of their shop. Art's Work Unlimited has consistently won top honors with over 40 awards as of March 2011 in national and international competitons. They are reliable and show up on time as scheduled, and return your phone calls. They are affordable, providing options when pricing the work you want done. They are able to customize everything to the size you need, not what is available. They use their expertise and craftsmanship to give you fine quality that will last many years. Whether your project is a gate, stairs, furniture, railings, a door, lighting, artwork, handrails, etc., they do their own installations in order to be sure your completed job is to your total satisfaction. They listen to your ideas, give helpful advice and then create what you envisioned. Call us during our business hours Monday - Thursday 7:30am - 5:00pm when you are ready to begin your project at the telephone number listed below. You can schedule an appointment with either Art Ballard or Phil Heermance, and we will be happy to provide directions to our shop. We are participating Members of NOMMA, National Ornamental & Miscellaneous Metals Association www.nomma.org . Today they have over 1,000 members across the U.S. and in over a dozen foreign countries. Members produce the full spectrum of ornamental and miscellaneous metal work. We participate yearly in the metal work competition in various categories. We encourage you to visit their website. We admire the truly skilled metalsmith artists with both old school and new techniques showing amazing metal work. FAYETTEVILLE, GA � Art's Work Unlimited of P.O. Box 700513, Miami has won an award(s) for outstanding craftsmanship in an international competition sponsored by the National Ornamental & Miscellaneous Metals Association (NOMMA). The event was open to over 700 member firms throughout the U.S. and in 12 foreign countries. 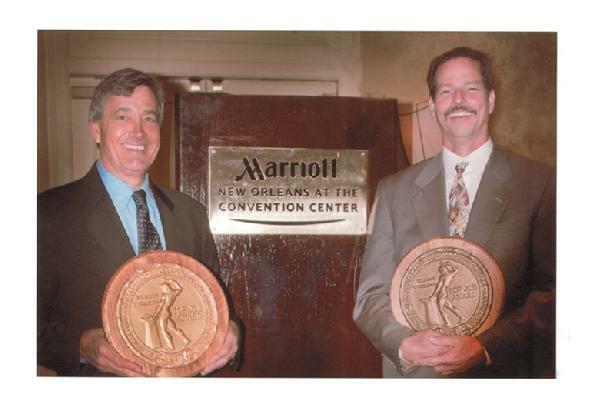 The presentation was made at a special banquet in New Orleans, LA, March 19, during NOMMA's 53rd annual conference. The Ernest Wiemann Top Job Awards Competition is an annual contest that recognizes outstanding work in the ornamental and miscellaneous metals industry. To win an award, entrants must submit photos and a description of their work. This material is then publicly displayed in a gallery where NOMMA member firms then vote. Winning a Top Job award has special meaning, since it represents a "voice of approval" from industry peers. The entry in the Gates, Driveway - Forged Category also received the Mitch Heitler Award for Excellence, which is the industry�s highest award for craftsmanship. The company is the first member to ever win the Mitch Heitler Award three times. To reach the company, call 305-247-9257. The history of Art Ballard and Phil Heermance was captured on the P.B.S. TV show NEW FLORIDA. In this short 4 minute video clip, they explain how they became metalsmiths, metal artists, and business partners. They each demonstrate a short sampling of their work creating a bird and leaves.